Stay focused on the data…. So US equity markets took a tumble yesterday for no good reason. Many people will assign the blame to the Chinese slowdown and associated EM risks. While this is understandable, it is still a spurious reason. Yesterday we got a couple decent readings on the manufacturing sector from Markit and ISM. Both prints were in expansionary territory. 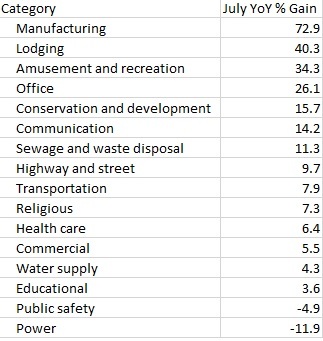 Given the headwinds that manufacturing has from the strong dollar and the fact that we are consumption / services based economy, I’m happy with this data. The dollar troubles will revert to the mean and we might get a slight uptick from here. This is par for the course manufacturing data at this point in the cycle. It was the strong construction print along with healthy revisions that got my attention yesterday. It also got the attention of a few weak handed sell-side economists who revised their GDP estimates up after having had such little faith in the economy up to this point. The moral of the story continues to be that the economic facts in the US show a healthy and growing economy. Below is a section from Table 1 from the http://www.census.gov report on construction spending. This, taken along with the strong housing data paints a rather robust construction picture. Again, the focus in this kind of market environment needs to be on the actual data and not what may or may not be happening overseas. The US economy is more insulted today from overseas shocks than ever before. Especially when it comes to banking. As someone who has been on the sell-side through the entire crisis, I can say that banks (through regulation) have learned their lesson. So yesterday we saw another collapse in oil and equities which really had investors spooked. Treasuries, however, did not have much of a rally at all. We know there were some sovereigns selling off the run bonds which certainly kept the rally subdued. Fixed income PM’s may also finally be seeing the writing on the wall that rates are going up and may not have such an appetite as before. A 2.20% 10yr in a 3% GDP economy just doesn’t work…We’ll have to wait for the bond math to catch up on that one. We get a few economic prints today with the two main ones being ADP and the Beige Book. The Beige Book is probably the most underrated data point out there. If you have the time and read at least the summary sections, it’ll be worth your effort. The BB gives you excellent color (no, no pun intended @UBTrader,@InterestArb lol) as to what is really going on around the country. You can read previous BB reports and see the data show up in other subsequent economic data points. With that, today is already shaping up to be another crazy one. At least the spooz are bid up so far this am. Oil is doing what it does best by going down and treasuries have a slight bid. Lets see what ADP brings us at 8:15…Good luck! !